Barbecues aren't just about burgers and sausages. You need something to wash all that tasty food down with, after all. You could go down the easy route and stock up on beer and mixers, or you could do something slightly fancier and make some cocktails. You don't need to be Tom Cruise to whip up something tasty for your friends and family: you just need a few simple ingredients. Of course, it's easy to get carried away when you're planning a get together with friends. There are lots of complex cocktail recipes out there, all calling for a range of weird and wonderful ingredients. If saving money is your goal, avoid them. If you're having trouble keeping track of your entertainment budget, give our budgeting software a shot. It makes it easy to keep an eye on how much you're spending and can help you understand how to save money by showing you where you need to cut back. We firmly believe that you don't have to splash a lot of cash to be the host with the most. These cocktail recipes are quick, easy, and use every day items that can be picked up on the cheap from your local supermarket. 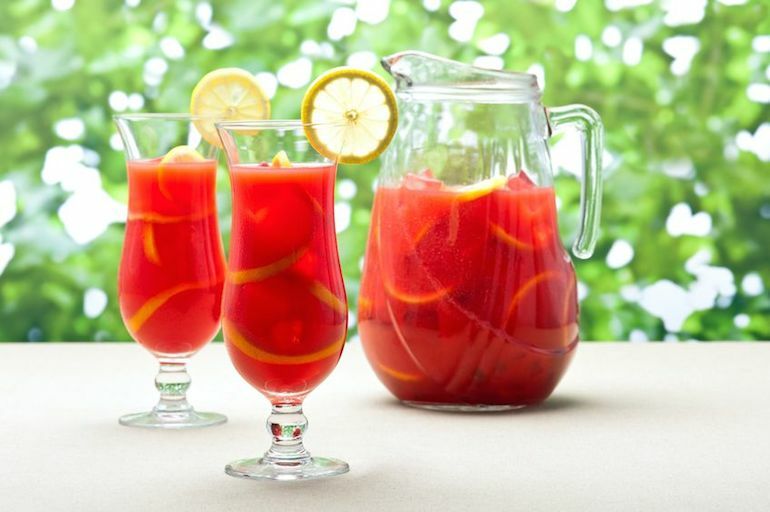 Sangria is the ultimate summer cocktail. It's usually made with red wine, but this recipe uses a refreshing and tangy white. Pour the wine into a pitcher and add the orange juice. Squeeze in the juice from the lemon and lime wedges, and toss the rinds in. Also add the sliced orange. Stir in the sugar and sherry, and chill the mixture overnight. Add the ginger beer just before serving. One sip of this and you'll think you're on a beach in Barbados, rather than a backyard in Blighty. Pop everything in the blender and whizz it up on medium until you have a nice slushy texture. Pour into glasses and serve immediately. It's just not a barbecue without lashings of beer, and this fun cocktail recipe takes boring old lager and adds a summery twist. Pour the cordial, tequila, lemonade, and beer into a large pitcher. Taste it and add sugar if necessary. Add plenty of ice, and serve with a wedge of lime.